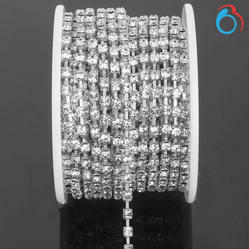 Being a noteworthy enterprise of this industry, we are offering a wide spectrum of Rhinestone Cup Chain. 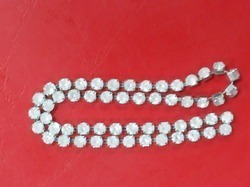 Cup Chains are metal chains (usually brass) which have cups on it which clasp Machine Cut Chaton Beads. The Cup Chain are available for the clients in different in varied dimensions and unique designs. The raw material used in the manufacturing of the beautiful and gorgeous Cup Chain is of optimum quality that has enthralled diverse national clients to place bulk orders. Cup Chain is obtainable from us at rock bottom prices.